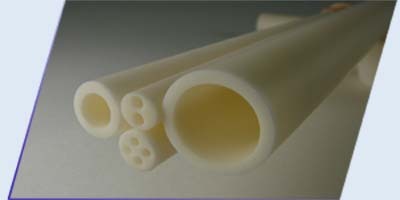 International Ceramic Engineering manufactures Alumina Tubes as a standard ceramic product. Alumina can take temperatures up to 1650°C, having extremely high temperature stability, chemical corrosion resistance, and high wear and abrasion resistance. Most items are in stock and can be pulled and shipped normally under 1 week ARO. Smaller diameter tubes are produced by extrusion, while larger diameters are produced by casting. Sizes are available from .050" OD to 8.25" OD in lengths up to 60" long. If you have a certain size you do not see on the list below, please contact us and we will be happy to quote your custom size. Custom sizes can be produced by request. Call (508) 853-4700 for price and delivery information.